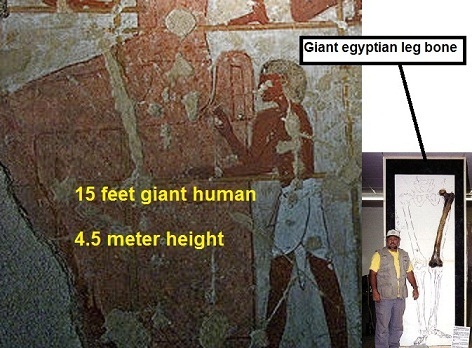 I made this topic to spread the hidden truth of giants in ancient egypt, The truth which archaeologists hide untill todays. They strongly fight to kill it because simply if that truth been known and appeared, Then evolution,darwin sciences,dinasour will be completely collapsed! The western archaeologists working along the biology scientists,they both are fighting to save big zone of their old biology sciences, the false sciences which we study it on all stages of schools. If u navigate into studying the egyptology as an amature,( between you dont need to professional in this field as its not chemistry, The modern people in this field are only repeating the same stuff of old archaeologists.....nothing changed), you will get the complete impression that this pharaoh history is full of contradictions and illogical stuff, that you will go into certain idea that there was a different civilization in egypt before the pharaohs......is it a mystery? no its not a mystery, The archaeologists themselves discovered many artifacts and stuff for the nations of early egypt before pharaohs but they deliberately stick everything under the name of pharaoh in order to remove the entire history of Giants, the giants were the early first nation who lived in egypt and after their era was over. kings were busy to build pyramids as tombs, the kings were living to only build a tomb...thats their logic.....but their palaces.....castles....temples....statues....civilization?? nothing, ONLY PYRAMID. where were the kings and their people living? they were living in Mud huts, COMPLETE LIES created by archaeologists. Kings were having a gigantic temples,statues........but very small tombs? were they unable to build a pyramid as tomb??? where were they living? in mud hut too or living in their temples? 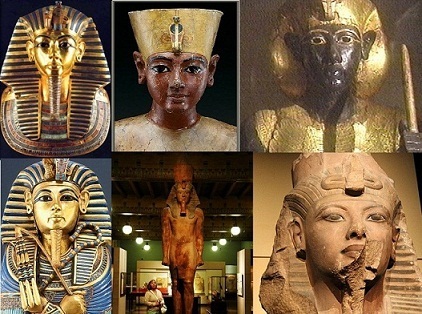 Nearly, Each pharaoh king and queen have various statues with different facial features, You could not know for example: Who was king Tut? king tut have different statues representing him, The calamity: Answer of egyptologists are nonsense, They give us lame answer" the statues were figurative" How come figurative? were the ancient egyptian artists idiotic to not draw face of each king on statues? The answer: NO, the ancient egyptian artists were extra professional to draw the face of kings and queens on each statue, and the king himself would spread his own face on statues to be known and memorized through history. 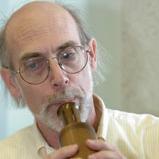 The egyptologists make lot of nonsense and dont know how to handle the contradictions of egyptology. There is missing chapters of this ancient history of egypt, the archaeologists do run a conspiracy. This is something i wanted to clarify before i take you into the truth about Giants. 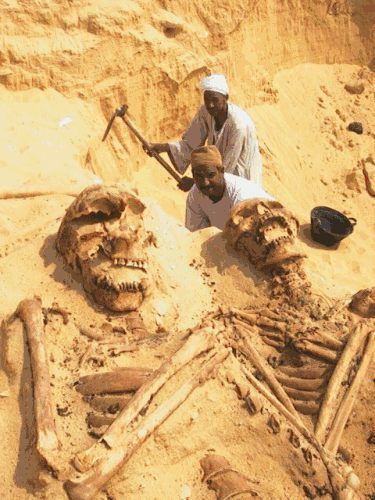 Did the giants of egypt really existed? how would you prove them? 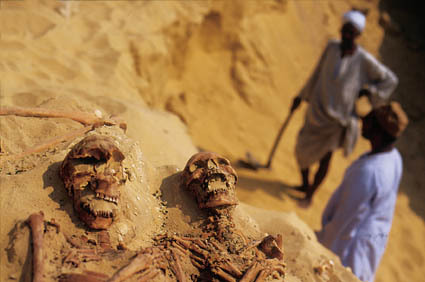 Since the archaeologists run a conspiracy over this subject, you will never find any official claim about the giants. except few works of researchers who are trying to bring the truth out for world. 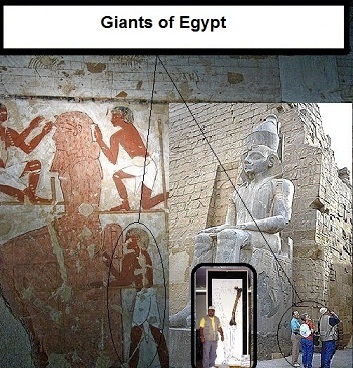 The giants of egypt existed 100%........actually when you have look at ancient egyptian monuments, you are going to stand front of Miracles, Miracles of obelisks, pyramids and those gigantic temples which their ceiling either was made by large pieces of granite stones. Who had that power to construct all these works? 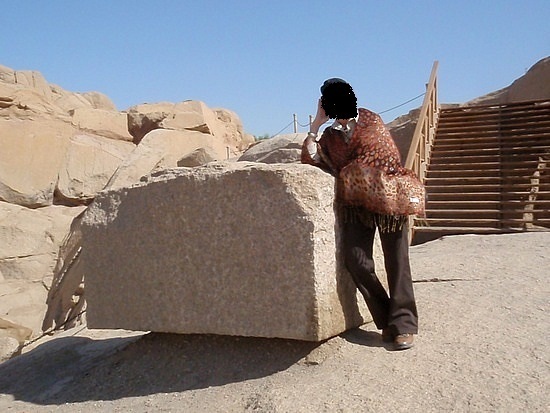 Stones in ancient egypt were damn large and not only some thousands of stones, But Millions and millions of stones which were cut and carved from mountains. The primivite work of cutting stones is Recorded on the decorations....Plus the remaining signs of cutting still sealed and left from ancient egyptians. The ancient egyptians used diorite stones as hammer to hit and split the granite stones,plus other metal tools. The power of giants did fulfill all this work, could you imagine a giant human of 10 meter tall, how would be his power???? those large stones to us, were small stones to him, and he was cutting and lifting and moving them. This is one of the lost links regarding the construction of pyramids.....How the stones were cut and moved? Only bring the Giant humans on table, They were able to do. The truth of giants existed in this tomb of rekhmire, which they rushed to stick it to vizier of king tuthmosis III, In order to not leave doubt about nations before pharaohs, they stick any tombs and any stuff from early ancient egypt to pharaoh kings. The construction of pyramids is fully depicted under scenes of pyramids where built by hands and very primitive work. ( something not known for people). rekhmire nor his king tuthmosis III did left any pyramid? then why shall pyramid construction be connected to them? well the archaeologists forgot to entitle some pyramids by king tuthmosis III, so the lie would be extremely believable. sculptors of statues were giants of 3 to 5 meter. stone cutters and obelisks lifters were 8 to 12 meter tall. the pyramids builders were 8 to 12 meter tall too. giant standing to kneeling statues was by tall of 3 to 3.5 meter. 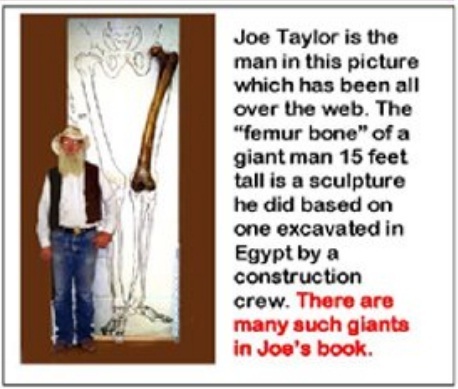 Joe taylor an american researcher who has been in egypt for many times by late of 50s and 60s,he cited several accounts of giant human skeletons in egypt. In rekhmire tomb, the art of colossal seated statue's construction, the sculptors were nearly the same height between 4 to 5 meter. Well you've presented a convincing argument, archaeologists are all dirty liars and you know the real truth. Where are the remains of your giants.I am not an expert but you will find that ancient cultures had no concept of scale when doing their pictographs and Petroglyphs. No. They are not a fact. Oh great. Another person who knows nothing about Ancient Egypt. I can just hear kmt_sesh pulling the last of his hair out. While there were no civilizations there predating dynastic Egypt, we do have evidence of several cultures to include Merimda, Maadi, Badari, Naqada, Abydos and Nekhen to name a few. And yes, there is evidence of more than just mud huts, but it appears the OP doesn't want to take the time to actually learn about Ancient Egypt. Evidently ignorance really is bliss. In the depicted stories: You would see " Giant king beat up small enemies", on the contrary, you would see " a king in the same size of his enemies beating them". This art of giant king belongs to different era. The next art of king in same size of his enemies belongs to newer era, after giant era was over. 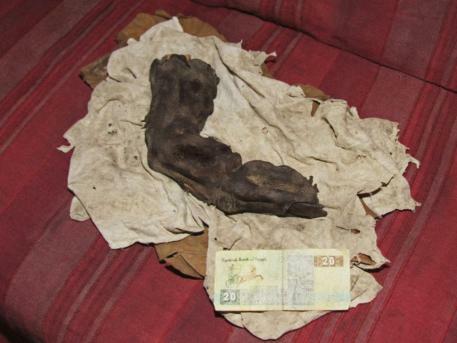 If you read them you find that the bone in the picture is not real but one that Mr Taylor sculpted based on a story. A story that as far as I can tell has never been corroborated. 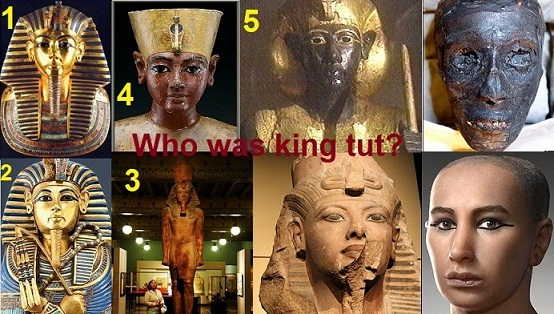 Just answer the point, why each pharaoh king had various statues with diff facial features? Mohammed ali basha, the sultan of egyptian and sudan kingdom left statues memorizing him, he didnt bring up a statue holding different person looking and write under it " sultan mohammed ali". Part of the archaeologists fabrication, they stick unknown statues to kings of pharaohs in order to not come a person make doubts in this history. Do you have pictures of it? Video is kind a bad. You cant see clearly. Oh, it's twue. It's twue. It's twue, it's twue! The OP is incorrect multiple times before he even gets to the part about giants. King Tut must've been the family midget then . 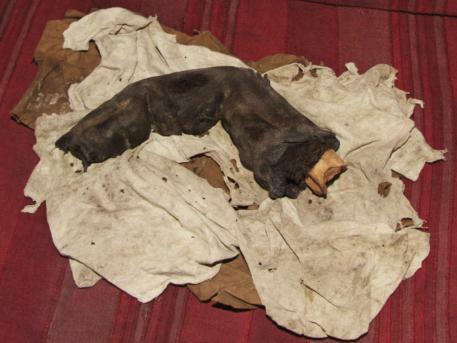 ...But a very normal-sized Ramses mummy. Scifi, legends, myths, comics.... dangerous stuff for some people to read or view. Absolute nonsense meant to underpin creationist fantasy. By logic: if you are a king or queen in your country, you would make a statues by different people and say its your statues? 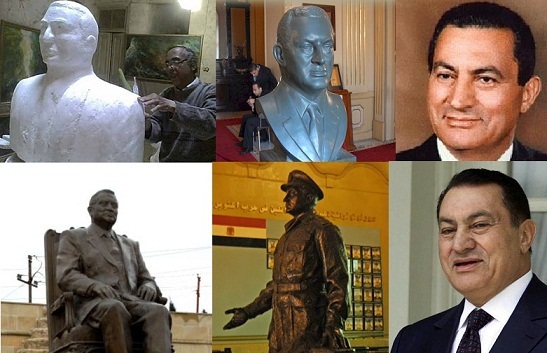 Mubarak statues were made to represent himself..................NOT OTHER PEOPLE! But King Tut according to the hypocrite archaeologist, King tut had many various statues representing him, these statues were not for one person but multi different people, So why this contradictions? Have we got a brain???? sorry for saying, Its idiotic people who would say these statues were figurative, why shall a king leave figurative statues, while he was about glory and to be memorized like his own lookings over history, So some people and next generation would come and say : This is king tut.......His features must be all ONE and Unique! King ramses III has many various statues represent him, they hold different people lookings. King akhenaton also has many various statues. queen hatshepsut aso has many various statues. And there are kings and queens from the grandparents who dont have statues at all, They forgot to memorize themselves and archaeologists put probability on some other statues that it was for and for. I may add the statues in ancient egypt too were not public figure like freedom liberity in usa, the statues were meant to represnt the kings and queens and their lookings. Dude, For sake of God.................................Insert brain in your empty head, sorry for this sarcastic statement.......its not insult but u just fool urself around. In the ancient times: There were NO MACHINES, NO TRUCKS, NOR ANY ADVANCED TECHNOLOGY. Do you think even 20 guys were able to lift this large stone? The only thing fake is your knowledgebase. In short, it's called artistic license. The Ancient Egyptians weren't creating statues to meet our standards of accuracy or ideas of what is aesthetically pleasing, nor is it likely that they would have cared what we thought of same. Mohammed ali basha is irrelevant to a discussion of Ancient Egypt for multiple reasons, among which are that he didn't live in Ancient Egypt and he comes from a completely different socio-religious background. Again you're comparing apples and oranges and complaining that they're not the same.